Pulsars are extreme stars left behind after the explosions of certain supernovae. They have masses slightly larger than the Sun, but concentrated in a very compact volume with a radius of approximately 10 km. Moreover, they spin very rapidly, with a rotation period that ranges from 1 ms to a few seconds, and they have giant magnetic fields, billions to millions of billions of times more intense than the Earth. Pulsars are identified by measuring short pulses of radiation, from radio to gamma rays, produced by beams of particles accelerated by the giant electromagnetic fields rotating along with the pulsar itself. There is, however, another observational manifestation of pulsars, that is, extended nebulae surrounding them that we can see in radio emission, X-rays, and gamma rays. We think that these nebulae are powered by winds of energetic particles and electromagnetic fields left behind by the pulsar, with some mechanism, not fully understood yet, that contributes to further accelerate the particles. It has long been suspected that this may happen close to the place where the pressure of the wind equals the pressure of the material around the pulsar, and the wind is abruptly terminated with the generation of a shock. The Vela constellation shelters a well-known pulsar, which also has an associated pulsar wind nebula, called Vela X. The Vela Pulsar, a neutron star corpse left from a titanic stellar supernova explosion, shoots through space powered by a jet emitted from one of the neutron star’s rotational poles. Now a counter jet in front of the neutron star has been imaged by the Chandra X-ray observatory. The Chandra image above shows the Vela Pulsar as a bright white spot in the middle of the picture, surrounded by hot gas shown in yellow and orange. The counter jet can be seen wiggling from the hot gas in the upper right. Chandra has been studying this jet so long that it’s been able to create a movie of the jet’s motion. The jet moves through space like a firehose, wiggling to the left and right and up and down, but staying collimated: the “hose” around the stream is, in this case, composed of a tightly bound magnetic field. NASA/CXC/PSU/G.Pavlov et al. Public domain. The pulsar is at only about 900 light years from Earth, therefore many telescopes are able to make out a lot of details in the structures of the nebula. It extends over more than 30 light years, far beyond the wind termination shock. The complex structures are thought to be produced by the evolution of the supernova remnant and pulsar wind nebula inside an inhomogeneous medium. H.E.S.S. has detected bright very high-energy gamma-ray emission from Vela X [1,2]. The bulk of the emission coincides with an elongated structure, dubbed the cocoon, very bright in X-rays, seemingly emanating from the wind termination. Fig. 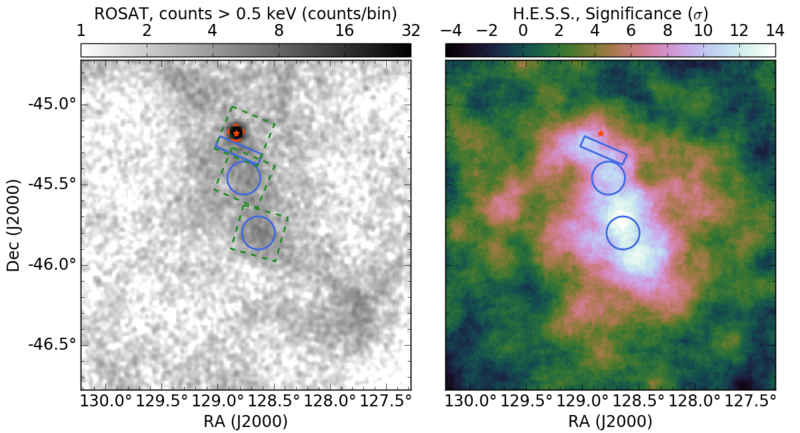 1: Map of the Vela X region in X-rays (left, data from the ROSAT telescope) and in very high-energy gamma rays (right, data from H.E.S.S.). The star shows the position of the Vela pulsar. The green boxes show the regions observed by Suzaku. The blue regions are those for which we derived the X-ray and gamma-ray spectra. Note that in the upper region we avoid the immediate surroundings of the pulsar (red circle), where there is bright X-ray emission coming from the star itself and the region of the wind termination. X-rays and very high energy gamma rays are highly complementary probes to unveil the physical processes at play in pulsar wind nebulae, because they are produced by the same relativistic electrons. On one hand, X-rays are produced by electrons moving through magnetic fields in a process known as synchrotron radiation. On the other hand, gamma rays are produced by the same electrons impinging on low energy photons, mostly the cosmic microwave background radiation, in a process known as inverse-Compton scattering. In principle, by combining all of this information, we can determine the properties of the electrons and of the magnetic fields. In practice, however, often the limited angular resolution of gamma-ray telescopes prevents us from doing so, because in gamma rays we measure emission from particles accumulated over the whole life of the pulsar and sample regions with varying magnetic fields, whilst X-ray emission is dominated by the regions with stronger magnetic fields near the star. For Vela X we can overcome this problem because it is very close to us, thus it has a large apparent size and we can discern the details of its structures (Fig. 1). We study three compact regions in the Vela X cocoon covering distances of 1 light year to 15 light years from the wind termination (Fig. 1). For the three regions, we determine how bright the very high-energy gamma-ray emission is for different gamma-ray energies, using 100 hours of observations performed by H.E.S.S., and how bright the X-ray emission for different X-ray energies is, using data from the Suzaku space telescope. Then we calculate the synchrotron and inverse-Compton emission of a population of electrons in a magnetic field and compare it to the measurements from H.E.S.S. and Suzaku. We find a very good agreement between this model and our data. Furthermore, this procedure enables us to infer the characteristics of the electrons and magnetic field. Within the uncertainties, the properties of the electrons and the strengths of the magnetic field look the same in the three regions. We can compare these results with two alternative scenarios for the origin of the relativistic particles in the cocoon. In a first scenario the electrons accelerated at or near the wind termination are quickly transported across the cocoon by the asymmetric shock wave resulting from the interaction of the supernova remnant with the interstellar medium. In this case, the properties of the particles in all three regions reflect simply the outcome of the acceleration process. The peak in the gamma-ray emission (Fig. 2) therefore reveals the maximum of the acceleration efficiency, beyond which the number of particles starts declining. From this we can determine the acceleration efficiency, which turns out to be 100 times smaller than in the Crab Nebula, the most famous pulsar wind nebula and the best studied. Fig. 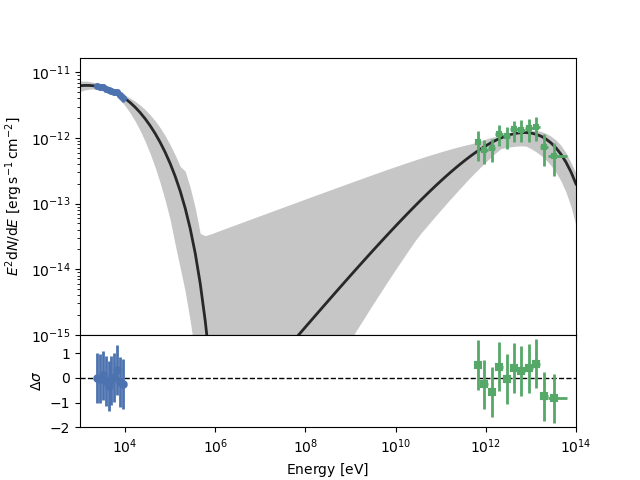 2: Brightness of X-ray emission (blue) and gamma-ray emission (green) at different energies (upper panel). The shaded band shows a range of possible models that reproduce the data. The black like shows the model closer to the data, with the difference between the two shown in the bottom panel. In a second scenario the electrons slowly move from the termination shock through the cocoon along the magnetic field lines, zig-zagging whenever they hit small fluctuations of the magnetic field in a process known as diffusion. In this case the electrons get to spend a lot more time in the high-magnetic-field region close to the termination shock where they loose energy by producing synchrotron emission. Since the higher-energy electrons tend to loose more energy in this process, this may explain the decline in the gamma-ray emission at the highest energies. The gamma-ray energy at which we find the maximum is consistent with this hypothesis based on the observations of synchrotron emission near the pulsar in X-rays. A question that remains open is: is the strength of the magnetic field always the same or does it vary? The results show that on average it does not change over the 15 light years spanned by the cocoon. On the other hand, there may be variations around the average value everywhere. If this was the case, we would expect a boost of the synchrotron emission at the highest energies . When we search for this effect using H.E.S.S. and Suzaku data, we cannot find a final answer. This pushes us to extend the observations to even higher energies in both X-ray and gamma rays, which we can do with existing or forthcoming telescopes such as NuStar and CTA. H.E.S.S. is a system of Imaging Atmospheric Cherenkov Telescopes that investigates cosmic gamma rays in the energy range from 10s of GeV to 10s of TeV. The name H.E.S.S. stands for High Energy Stereoscopic System, and is also intended to pay homage to Victor Hess , who received the Nobel Prize in Physics in 1936 for his discovery of cosmic radiation. 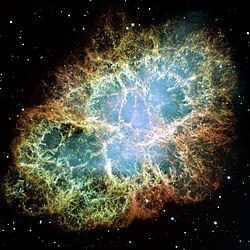 The instrument allows scientists to explore gamma-ray sources with intensities at a level of a few thousandths of the flux of the Crab nebula (the brightest steady source of gamma rays in the sky). H.E.S.S. is located in Namibia, near the Gamsberg mountain, an area well known for its excellent optical quality. The first of the four telescopes of Phase I of the H.E.S.S. project went into operation in Summer 2002; all four were operational in December 2003, and were officially inaugurated on September 28, 2004. A much larger fifth telescope – H.E.S.S. II – is operational since July 2012, extending the energy coverage towards lower energies and further improving sensitivity.